Preparing school lunches requires a lot of planning and making sure government nutritional standards are met, and High School District 211 has proven that it provides quality meals to its students. The District received results from The School Meals Initiative Review, which is a nutrition audit of the lunches served within the District done in collaboration with the Illinois State Board of Education and Southern Illinois University. District 211 met and exceeded expectations for high school lunches. Click to enlarge nutrition chart. The review looks at every nutritional aspect of school meals and what is being served, including even the ketchup and mustard packets that are handed out. A week of menus is selected for review, and the District provides recipes, labels from food, and production records from what was prepared and served, to be analyzed. Lauren Hummel, director of food services, said District 211 met or exceeded all areas, except that the meals analyzed fell just short of the weekly goal for calories. Although the District is not ranked against other schools, Hummel said District 211 is doing quite well. One thing that surprised the reviewers was the amount of milk consumed at each school. Hummel said it’s roughly 95 percent of students buying a complete lunch at each of the five District high schools. Preparing the menu is looked at day by day, so it ensures all guidelines are met for that week. 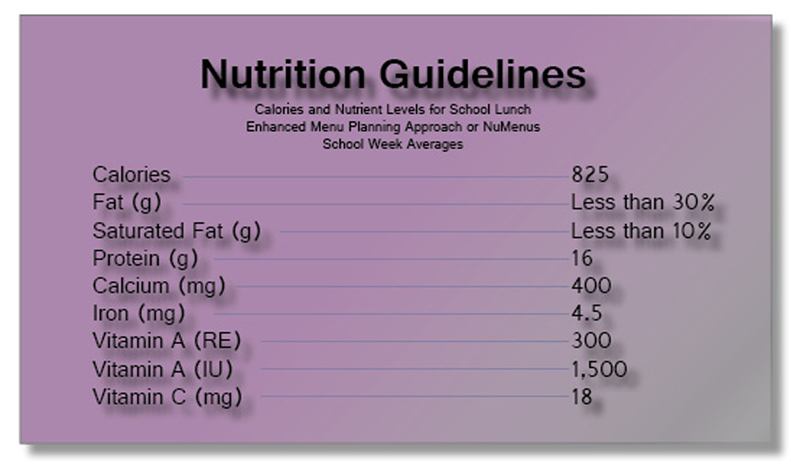 Part of what makes planning for adequate nutrient consumption difficult is that high schools operate on an “offer versus serve” system, which means students have the ability to decline portions of the meal. This is why creating healthier meals and offering the right combination of foods is so important. Some recipes come from the USDA, but most are from “scratch cooking,” where recipes are created at the schools based on guidelines, taste, and esthetics. Hummel said the District tries different combinations of recipes to make sure they meet guidelines and are appealing to students. For more information about the food audit, contact Lauren Hummel at (847) 755-6680.